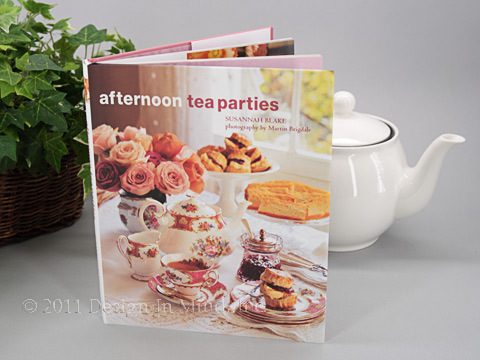 Books on traditional and theme tea parties with suggested menus and recipes. by Elysa Markowitz. Personal blending can be so much fun! This book features the Tribest Personal Blender, and can be used as a beginners' guide to create delicious recipes. 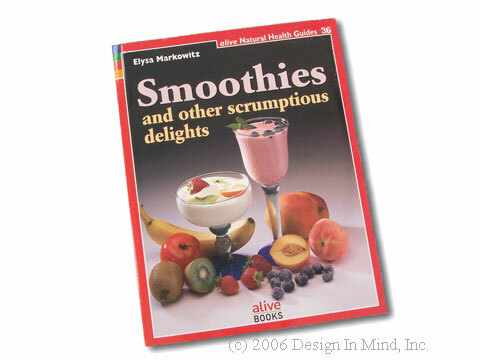 Discover that not only can you create yummy mouth-watering smoothies, but also whip up such delicious tasting recipes such as dressings, pestos, sauces, soups, sorbets, and more! Raw, enzyme-rich smoothies are a great health value for the whole family to enjoy. Discover such delights as: Blushing Cashew Sauce, Brain Builder Smoothie, Mellow Salso, Summer Sublime Soup, Berry Cherry Lemonade, Lean Italian Dressing, Papaya Pudding, and many more! Over 50 easy recipes in full colour. Quick and wholesome and simple to create from your kitchen or even on the go! Getting to know your blender has never been so healthy so discover a complete new way to enjoy smoothies and other scrumptious delights. The Tribest Personal Blender is in our Kitchen/Kitchen Tools section. 500 of the Most Important Health Tips You'll Ever Need. 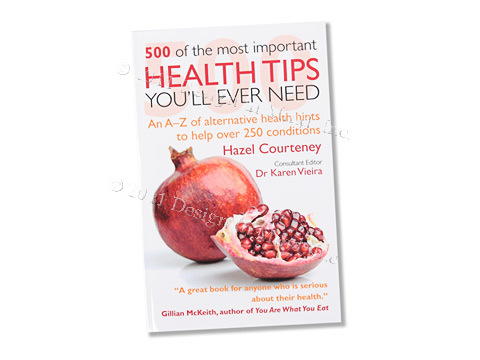 An A-Z of alternative health hints to help over 250 conditions. Includes thousands of little-known facts, plus remedies, dietary advice, and helpful hints on how to prevent, heal, and where to find more help for over 250 ailments. Discover which supplements and super foods, such as pomegranates and tomatoes, can promote weight loss and help prevent heart disease, cancer, and high blood pressure. By Hazel Courteney. 432 pages. 6" x 9". Softcover. Afternoon Tea Parties by Susannah Blake. 20 tea-themed chapters of irresistible menus for a variety of afternoon tea parties offering delicious recipes, and creative ideas to host a memorable tea-time gathering. Whether it's a summer tea party in the backyard or a cozy gathering in front of the fire, afternoon tea is a treat any time of the year and the perfect way to celebrate a special occasion. Susannah Blake's ideas include an elegant Classic Engish Tea with delicate finger sandwiches and Lemon Drizzle Cake: a Fireside Tea with Toasted Teacakes and Sticky Mazipan and Cherry Loaf: or a self-indulgent Champagne Tea with Smoked Salmon Crostini and Strawberries and Cream. Girl friend get-togethers include a Bridal Shower, a Sweet Sixteen Partly, and a Baby Shower. This is the perfect book for tea party enthusiasts everywhere --providing plenty of ideas and delicious recipes for this much-loved tradition. Beautiful photography by Martin Brigdale. 144 pages. 9 1/2" x 7 3/4". Hardcover. 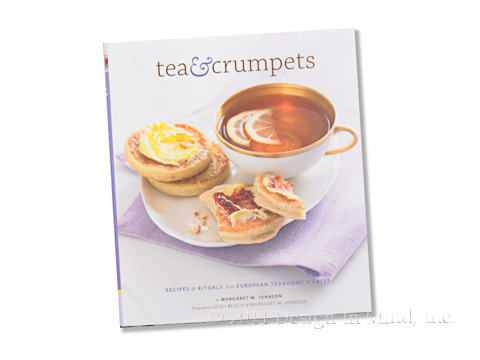 Tea & Crumpets by Margaret M. Johnson. Tea & Crumpets tours the legendary tearooms and storied salons of Europe, serving up simplified recipes for recreating at home the sandwiches, pastries, cakes, and confections that have made these destinations famous. Perfect for the curious armchair traveler, nostalgic food excursionist, and inventive home entertainer. Over 60 recipes with wonderful photos. Chapter titles include: From Leaf to Cup: A Little History of Tea, Sandwiches & Savories, Crumpets, Scones & Fruit Breads, Teatime Sweets, The French Art of Tea, and A Traveler's Guide to European Tearooms. 8 1/4" x 7 1/4", 180 pages, hardcover. 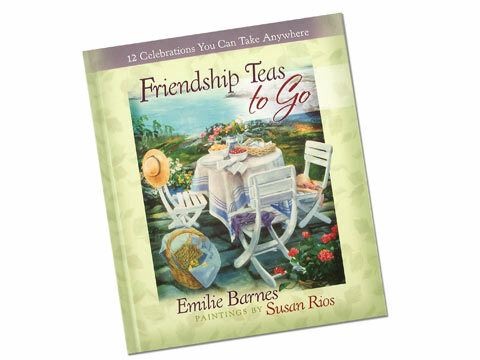 Friendship Teas to Go: 12 Celebrations You Can Take Anywhere by Emilie Barnes, illustrated by Susan Rios. Simple and clever ways to take the pleasures of tea anywhere and everywhere. A dozen themed charming paintings of delicate cups and tranquil settings beckon readers to savor tea moments. 12 themed chapters include new recipes, memorable stories, and special tips for transforming any moment. 64 pages. 8" x 9 1/4". Hardcover. 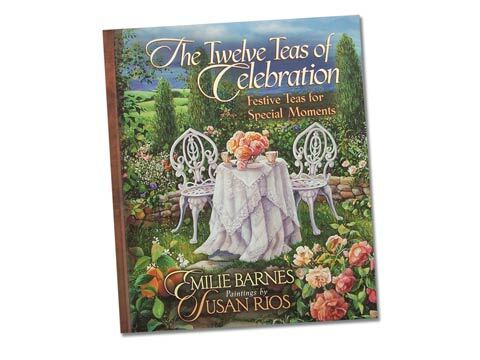 The Twelve Teas® of Celebration: Festive Teas for Special Moments, by Emilie Barnes, illustrated by Susan Rios. 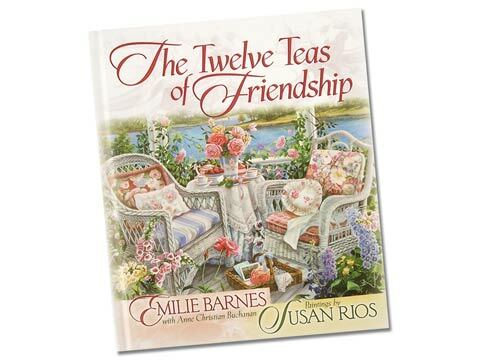 A full year of special teatime ideas invites the blessing of friendship into readers' home every month. Each special theme includes recipes, decor ideas, and delightful details about the story of tea. These 12 ready-to-plan parties place friendship as the centerpiece for every celebration. Start the new year off right: A Celebration of Beginnings. Chocolate brings friends together: A Celebration of Sweet Pleasures. Mothers are queen for the day: A Celebration of Women. 64 pages. 8" x 9 1/4". Hardcover. The Twelve Teas® of Friendship. Emilie Barnes offers a warm and exciting tea party theme for each month of the year. Delightful decorating ideas and delectable teatime recipes will inspire you to welcome friends into your home. Soft, quiet rooms, lush floral gardens, and peaceful ocean settings created by artist Susan Rios provide the perfect backdrop for planning a cozy day among friends. 96 pages. 8" x 9 1/4". Hardcover. What's short and sweet and cute as a button? Cupcakes! And everyone loves 'em! Here are 50 scrumptious ways to bring smiles and those nostalgic memories back. Try a Cinnamon Sugar Puff Cupcake, they go from mixing bowl to oven to a happy eater in less than an hour. Who needs a peanut butter cup when there's a peanut butter cupcake in the house? 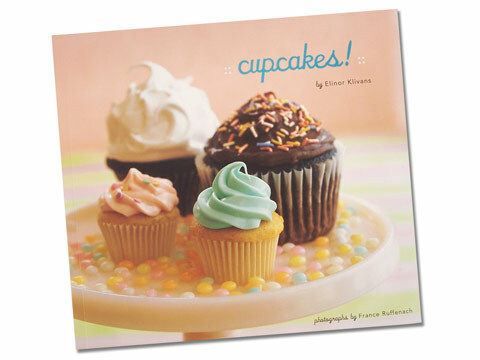 With tips and techniques for perfect cupcake-making, basic "head-start" recipes, and gorgeous photographs, it's time to get out the baking pans and join the cupcake craze. These diminutive cakes may be small but they stand tall in the world of sweets. Author Elinor Klivans is a notable food writer, and author of several cookbooks. 144 pages. 9" x 8". Softcover. Entertain your guests with a full evening of lively game questions and shared cooking and serving duties. 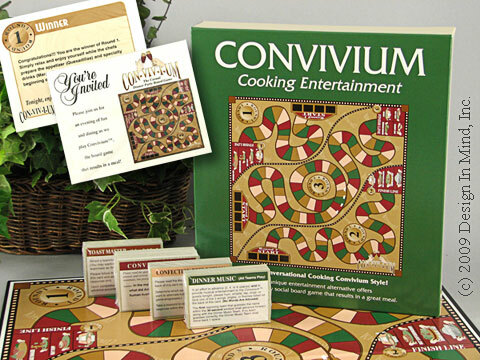 The "Convivium" experience is divided in 3 game sessions followed by the duties assignments for 3 courses of an enjoyable ethnic meal. Easy to prepare recipes are included. Comes with a mexican meal preparation guide & shopping list. Other menus available at the Convivium website.